Welcome to 1986! At least, welcome to my recap of what was happening on the ARIA singles chart that year. If you're just joining us, each week I'll take a look back at all the new songs to appear on the top 50 - and provide a brief snapshot of the top 100 entries that never made it onto the printed chart available in all good record stores (and probably a few bad ones). 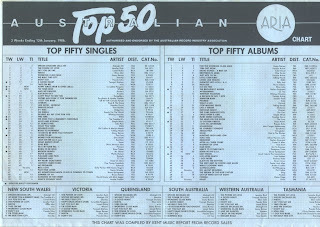 The first chart bearing a date in 1986 also covered the last week of 1985 and was the end of an era for the ARIA top 50. Having more or less maintained the same format since its launch in July 1983, the printout was about to undergo a massive change - but more on that next week. Holding down the number 1 position 30 years ago this week was Midnight Oil's Species Deceases EP, which, thanks to the extended period covered by this chart, added three weeks to take its tally to five weeks on top. He'd already landed three big hits from Reckless, so going for a fourth was probably pushing it. This tale of a one-night stand was, however, yet another big single for Bryan in North America. Here's another single that did much better in North America than on the ARIA chart - and that's despite the song about JCM's Indiana upbringing being only the second release from Scarecrow. Just as "Listen To The Man With The Golden Voice" failed to match the success of "I Am Only Shooting Love", so too did this follow-up to "Endless Road" falter for the Dutch synthpop band. Dodgy video alert! Thanks to this double A-side single, we have two songs this week about singers' hometowns and two festive tunes - with The Boss including one of each on this release. The seventh and final song lifted from Born In The USA, "My Hometown" was no doubt boosted up the ARIA chart by the presence of Bruce's 1975 live rendition of the Christmas classic, which had previously only been available on a 1982 kids' compilation. 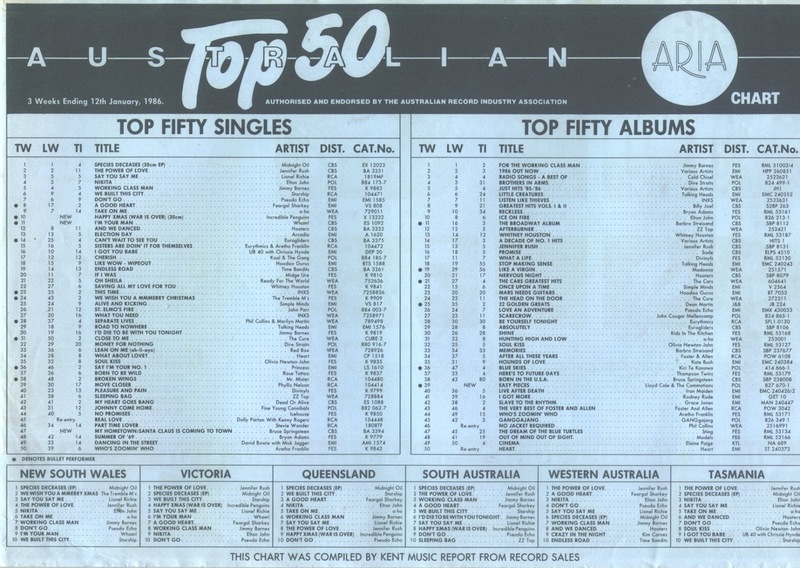 By reaching number 47, the single became the seventh top 50 hit from the album in Australia. In the US, it was even better news, with "My Hometown" making it seven out of seven top 10 hits from Born In The USA. 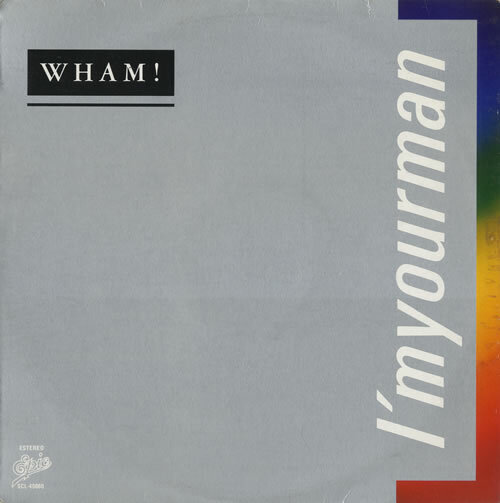 Number 11 "I'm Your Man" by Wham! After a blockbuster 1984, during which both Wham! and singer George Michael registered separate number 1 singles in Australia, it had been a quiet 1985 for the pop duo. Well, they did become the first Western pop group to tour China that year, but there was a notable absence of new releases, with only "Everything She Wants" hitting the chart earlier in 1985 - and that had originally been the B-side of 1984 festive single "Last Christmas". Then, in the dying weeks of the year, a brand new single emerged. It might seem odd for a Christmas song to be appearing in mid-January, but of course this ARIA chart was in record stores for the three-week period from December 23, 1985 to January 12, 1986 - and would've reflected sales from before that. Even so, had the charity cover of the John Lennon tune been released slightly earlier, it might've enjoyed a longer chart life than its run of 90-10-26-45-79-81 and, in turn, raised more money for its cause. Yes, it technically spent three weeks at number 10, but you get what I mean. Anyway, as for the specific charity - fittingly, the record was released to raise money to go towards research into the reasons for the declining numbers of little penguins in Australia. That's actually the official name - I'm not just describing how big they are - of the type of penguin also known as fairy penguins. The cause was chosen by single mastermind Molly Meldrum, who also produced the track and recruited singers such as John Farnham, Angry Anderson, Scott Carne, Colin Hay, Brians Canham and Mannix, and even Bob Geldof to feature on it, backed by covers band Incredible Penguins. Next week: the ARIA chart goes through its first major transformation. Plus, six new entries from Grace Jones, Thompson Twins, The Cars and more. If you want something to read before then, the link at the bottom takes you back to the last chart of 1985 (and that post has links to every other week in 1985). And if you are interested in what I was listening to in 1986, my personal top 100 for the year is here. Oh, and I'll be heading back to 1991 tomorrow as part of my 25 Years Ago... posts. I'm amazed that 'Small Town' peaked so low, given the massive amount of airplay it received, and probably for some years later during the 'classic rock' era of FM. 'I'm Your Man' seems kind of overlooked now compared to other Wham! hits. I wasn't familiar with the Incredible Penguins track until its recent airing on rage. Kind of cringe-worthy that Bob Geldof was roped in for an Australian charity record, as though we didn't have enough of our own 'talent' to use (which might be an accurate assumption, looking at some of the 'artists' featured). I'm curious to see what the chart scan will look like next week. I notice that despite it being a 'three week chart' the TI for the 12 Jan chart only went up by one week from the previous chart in December?? Was this common at this point, my memory of the early 90's charts is that when they took a break over Xmas, they added on the correct numbers of weeks to the 'time in chart'?? The extra weeks will be reflect in next week's TI column. For some reason, they don't appear on the charts that go for the extra weeks but are added on in the following chart.